Drinking-water wells in Pennsylvania close to natural gas sites do not face a greater risk of methane contamination than those farther away, according to a new study published in Environmental Science & Technology (ES&T). But the study is now being called into question because of its methodology and some undisclosed ties to energy giant Chesapeake Energy. But scientists not involved in the study reacted cautiously because of its methodology, in which Chesapeake sampled treated water and used a methane sampling method that major water labs don’t use. Further, the study authors failed to divulge the scope of their ties to Chesapeake, including fees the company paid to Siegel to carry out his research. One of the paper’s four co-authors, Bert Smith, worked for Chesapeake during some of the period when the study took place, which also wasn’t disclosed. Smith works for the company today. The paper only acknowledges that Chesapeake provided the dataset. Chesapeake, the nation’s second-largest producer of natural gas, shared its water samples from northeastern Pennsylvania with Siegel about three years ago because he had gained a reputation among oil and gas companies as a fair researcher, he said. “I agreed to work on the project as long as I was unfettered in what I do and say,” Siegel said. Chesapeake and Smith declined to comment. Siegel said Smith’s affiliation with Chesapeake was not revealed in the paper because Smith worked elsewhere for most of the time the analysis was being done. Smith’s work history on LinkedIn changed over the last two weeks, showing conflicting accounts of his employment in the last two years. But a presentation of the methane paper at an October 2014 conference lists Smith as a Chesapeake employee. The paper, when it was received in November 2014 by ES&T, however, lists Smith as an employee of Enviro Clean, an Oklahoma-based environmental remediation company that is a Chesapeake contractor. Siegel, a hydrogeologist with long experience in the Marcellus Shale, said isolated cases of methane contamination from gas development have occurred as fracking spread through the area. But he called fears of widespread water contamination overblown. Siegel challenged, in particular, studies led by the influential former Duke University earth science professor Robert Jackson. Jackson’s teams found a correlation between proximity to gas development and elevated concentrations of methane in residential well water. His research, known as the “Duke studies,” has been widely cited and was used by New York officials in the decision to ban fracking, according to reports. Jackson, who is now at Stanford University, disputed Siegel’s characterization of his studies. “Our goal is to understand the exceptions, the minority of cases where something went wrong; why it happened; and how can we keep it from happening somewhere else,” he said. Jackson said he offered to Chesapeake to help analyze its well data, but the company did not respond. The Siegel study was based on water samples taken between June 2009 and November 2011 from homes within a three-quarter-mile radius of Chesapeake’s planned new gas wells. Because the region already had so much gas development, in many cases an operating well was already nearby, the paper said. In 75 percent of the cases, no methane was detected. [Easy to sample contaminated water and let methane escape. In the bogus water contamination investigations in Alberta, the regulator proved itself an expert at it. 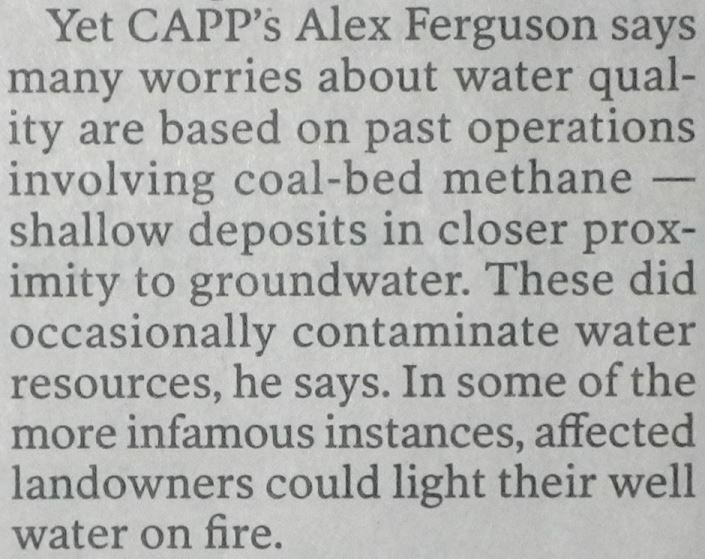 Also, if water wells were not purged adequately, the samplers are assured of not getting representative methane concentrations from the aquifers, which Alberta Environment proved itself also expert at] The rest showed some methane but no relationship to gas well proximity. The Chesapeake samples were gathered a few months before drilling; they didn’t track the wells over time to see if changes occurred. A 2013 Duke study of 141 water wells in northeastern Pennsylvania found 82 percent contained methane. Contaminated wells within about a half a mile of an active gas well had concentrations of methane six times higher than those farther away. The scientists looked at the ratio of noble gases such as helium to methane in contaminated water. They also looked at the levels of ethane and propane in methane-tainted water. Particular ratios of helium to methane and certain levels of ethane and propane in contaminated water indicated that some methane was from a deep geological source, such as the Marcellus Shale. The isotopic fingerprint of the methane was also similar to that of Marcellus gas. The studies suggested the Marcellus methane ended up in well water because of the wells’ faulty metal casings that allowed the methane to seep out into aquifers as natural gas was pumped to the surface. The research said the leaks could also be linked to poor concrete construction inside gas wells. Jackson also challenged the study’s water collection methods. Chesapeake hired contractors to sample the water at the tap. As a result, some of the water had already undergone treatment on its way from well to faucet. Treatment and running the water adds “noise” to the readings and affects the amount of methane in a sample, Jackson said. Further, the contractors used the so-called inverted bottle method to collect the samples, which entails placing an upside-down bottle in a bucket of water to collect the escaping gas. Jackson said he does not use the inverted bottle method because it doesn’t produce reliable results. The United States Geological Survey and some other major water testing labs do not use the technique to measure methane. Siegel said the testing protocol followed Pennsylvania regulatory guidelines. He said that testing water at the tap would not lead to substantially lower readings of methane. Chesapeake’s data would yield new papers in the coming months, Siegel said. 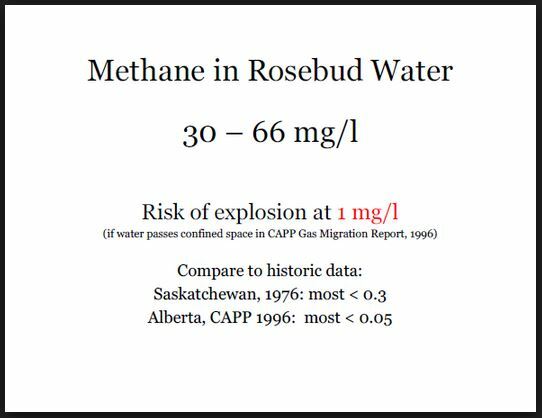 CAPP reported dramatically increased levels of methane in groundwater near leaking hydrocarbon wells. July 2014, DEP released 209 cases since late 2007; August 28, 2014 they released more cases, bringing total to 248 cases. Media FOIPed for and released the letters. 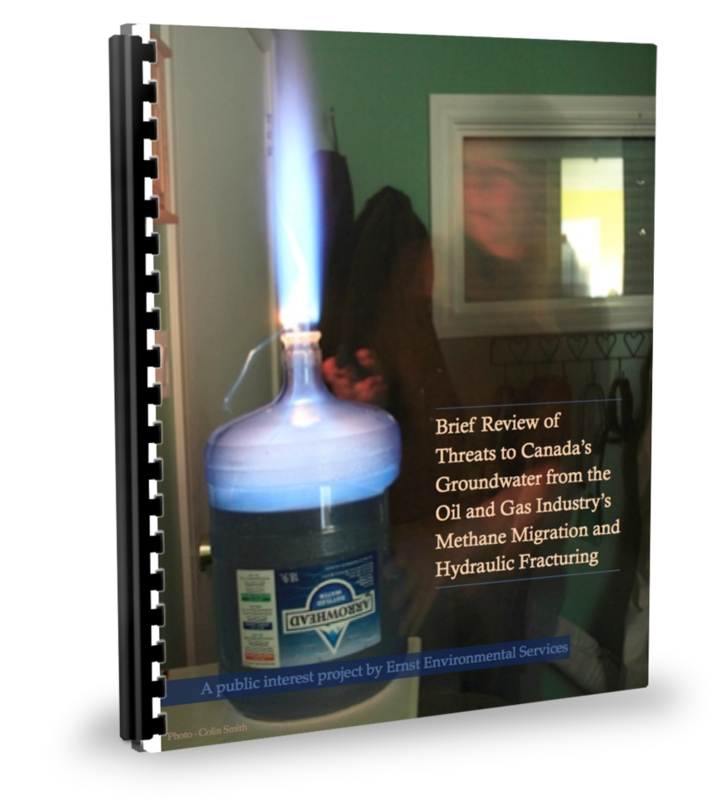 “There is a physical danger of fire or explosion due to the migration of natural gas into water wells or through soils into dwellings where it could be ignited by sources that are present in most homes/buildings. 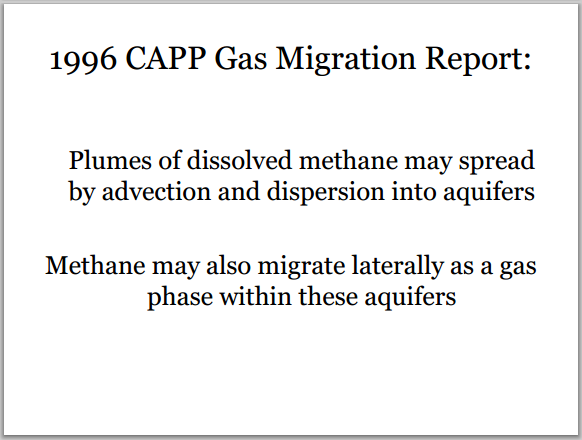 Natural gas migration can also cause threat of asphyxiation…. “That’s actually fairly common.” EnCana VP, Mr. Gerard Protti (appointed Chair of the AER by the government in 2013) in a 2006 interview about Ernst’s water. Ohio Valley Energy purchased the home of Mr. and Mrs. Payne where the explosion took place…. 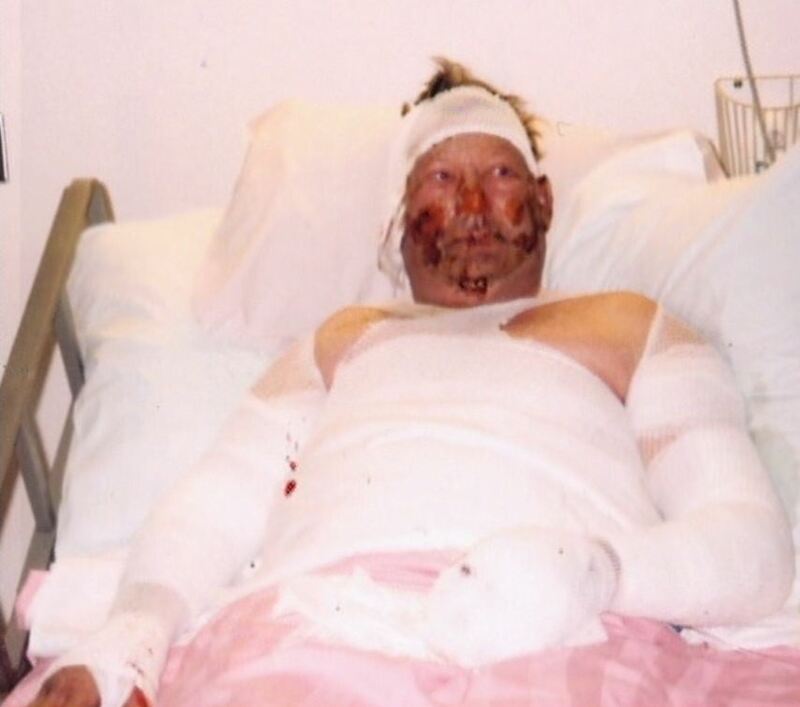 Dr. Swann: Three years this man waited for investigations. He still has no explanation of why his water exploded. Mr. Speaker, the Minister of Environment has not met the mark in protecting our most vital resource. 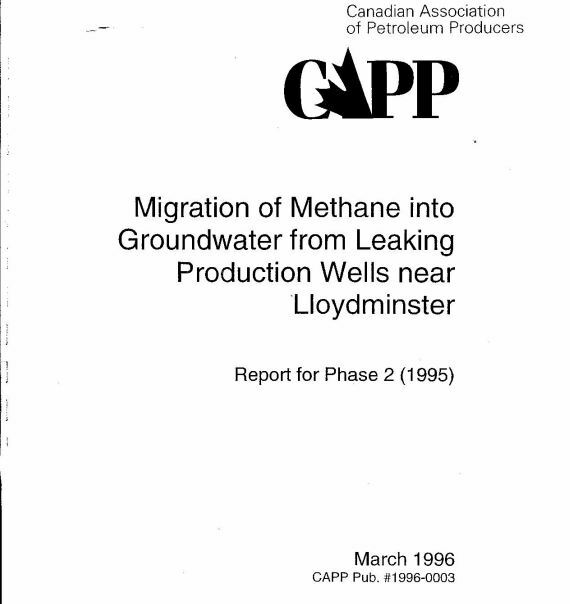 The released records also revealed that Alberta Environment edited Dr. Blyth’s publicly released “Independent” Summary Report of the four water contamination investigations by Alberta Environment (on the Zimmerma, Signer, Lauridsen and Ernst water wells). The purpose of the Summary Report is to inform the general public about the findings of the ARC scientific reviews and to increase public confidence in the AENV complaint investigation process.